ROAD TOWN, Tortola, VI – While noting that no party appeared ‘snow white’ during the proceedings, Magistrate Dr. Velon John placed emphasis on the fact that the Crown did not bring enough evidence to prove its case of assault against Marlon Senhouse, 20, when he appeared before the court today, January 21, 2014. Senhouse was found guilty on charges of resisting arrest, giving a false name and using insulting or indecent language but the court ruled that there was not enough evidence for him to be found guilty on the charge of assaulting police officers. Among the issues mentioned, Magistrate John said a medical form should have been submitted for the injuries reportedly suffered by the Officer and also evidence provided to the court of the alleged torn uniform. “The Crown must prove its case not recite its case beyond a reasonable doubt,” Magistrate John related. He further noted that the Court paid particular attention to the demeanour of the witnesses as evidence was being given during the trial. Senhouse was reprimanded and discharged for giving a false name and was fined $100 for insulting or indecent language and given 48 hours to pay or 4 days imprisonment. He was also fined $200 for resisting arrest and given 7 days to pay or an alternative of 7 days imprisonment. 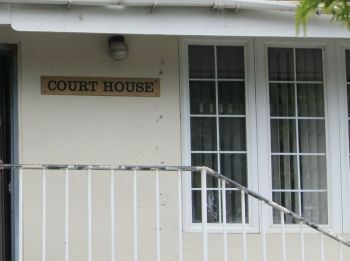 ROAD TOWN, Tortola, VI – A man accused of assaulting two Police officers and giving his name wrong, told the Magistrate’s Court today, January 14, 2014, that officers he allegedly assaulted had no evidence against him and were simply lying. A tearful Marlon Senhouse 20, of Brandywine Bay took the witness stand and swore several times that he did not assault the officers and did not give a false name when he was arrested. Senhouse previously pleaded not guilty to the offences of giving a false name, assault on Police, insulting language and resisting arrest. The offences were allegedly committed on September 6, 2012 at Brandywine Bay Beach against Police Officers Wendell Anthony and Marvin Robinson, who are currently before the Court charged with assault in an unrelated matter. According to Senhouse, he did not know why he was arrested or handcuffed by the officers and was also not given any reasons or explanations during his arrest. “They have no evidence against me,” Senhouse alleged before the Court when asked what reason one of the officers he described by the nickname ‘Food’, had to lie on him. The defendant also told the court, that Officer Robinson fell and injured himself on an old refrigerator because he was unaware of where it was at the time and was struggling to hold him (defendant). He also testified that he ran from the officers because they were allegedly “trying to do [him] something”. According to Senhouse, the officers allegedly kicked him in the area of his ribs while he was on the ground and rested their knees on him while he was handcuffed to a fence. The defendant confessed before the Court to giving an incorrect name after an officer allegedly told him that he did not believe his real name was Marlon Senhouse. The defendant subsequently confessed during his testimony to using insulting language, resisting arrest and using a false name, but strenuously denied that he had touched the officers at any time. Senhouse gave testimony after two of the officers, Anthony and Robinson, offered evidence in the trial. Crown Counsel Herbert Potter did not tender any material evidence during the trial. 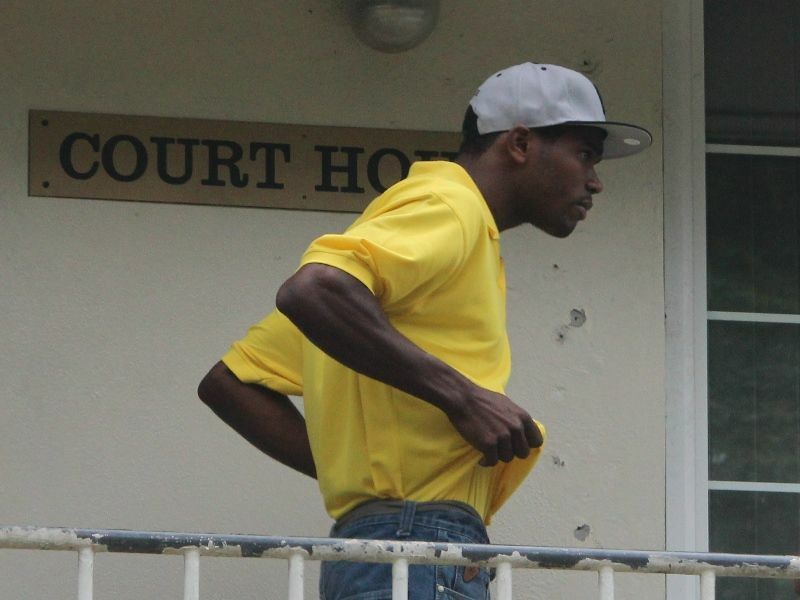 The matter will continue on January 21, 2014, when a decision is expected to come from Magistrate Dr Velon John. According to the allegations read by Crown Counsel Potter, at about 12:45 p.m. on September 6, 2012, Constables Anthony and Robinson, and Auxiliary Officer Morrison were on duty in uniform at Brandywine Bay on the said day when they approached the defendant, who was sitting beside a bar in the vicinity of L & M mechanic shop at the time, and after allegedly identifying themselves, asked the defendant if he knew anyone that goes by the name ‘Hoggy’ to which he replied in the negative. Constable Robinson then reportedly informed the defendant that he smelled a strong scent of marijuana on the defendant’s breath and asked if he was smoking marijuana. Senhouse allegedly said “Yes, I was smoking a joint” but offered no reply when asked whether he had more "joints" in his possession. Constable Robinson then allegedly told Senhouse that he would like to conduct a search on his person for any illegal drugs and he allegedly agreed. When the Constable walked over to the defendant and was making a check on his left front pants pocket, the defendant suddenly turned and allegedly knocked the Constable in the area of his chest and left shoulder with his right hand. This caused the Constable to fall on an old fridge, cutting his left foot in the process, the Court was told. Further, the prosecution stated, the defendant then ran off but the officers gave chase and eventually caught up with him. The defendant was then told he was being arrested for assault on a Police officer at which time the defendant became aggressive and began shouting, the Prosecution added. Senhouse allegedly said “F.. ayo and move ayo mother [expletive] from round me”. When Constable Anthony informed him of the offence committed and that he would be reported, the defendant allegedly replied to him “man move your [expletive] island [expletive]”. The defendant, the Prosecution stated, continued resisting and Officer Morrison contacted the East End Police Station for help. About 15 minutes later, Inspectors Fahie and Sergeant 179 Williams along with Inspector Potter and Sergeant Vanterpool of the Task Force came on the scene. The defendant was later taken to the Road Town Police Station and when cautioned and asked for his name, he allegedly replied that he was Sean Smith of Brandywine Bay. However, his mother reportedly later identified him as Marlon Senhouse of Brandywine Bay. The defendant was read his rights and informed that he had been reported for the offences currently before the Court and on Friday, September 7, 2012 he was served with charges and granted Police bail. Why only these two cops names are calling in the abuse of the youths. Something is seriously wrong here. this boy was a former student, i am sadden by these young people in the court system. Those two cops always feel that there could hit ppl child how them want that Robinson one think he bad and food just fellowing him !!!!! Local commissioner my foot .......u all can't even read properly. Thats not the first time i heard of those cops hitting people!!!.... becuase they are the police they want to do you what they want and feel they can get away with it.. BUT Karma Is a B***H !!! I feel so sorry for this chid. and this child feel so sorry for you. glad he got a second chance.